Finding the right closing gift for your client can be tricky. You want to get them something unique and thoughtful but with all the options there are on the internet, it's easy to feel overwhelmed. Lucky for you, we've curated a list of some great closing gifts that areperfect for your client! This gift is perfect as the weather gets colder. Blankets make a great gift because they are used by just about everyone. 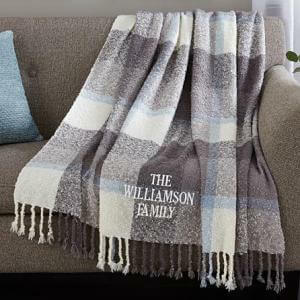 Give your blanket a special touch by having it embroidered with your clients last name. Gift your client with a gift card to be used on dinner and drinks at a local restaurant. Chances are they're new to the area and would love a restaurant recommendation. Can't go wrong with this one. Use what you know about your client to get them the perfect housewarming gift. Do they love wine? If so, wine glasses are a great choice. Do they love to cook? Try a spice rack with a cool design. 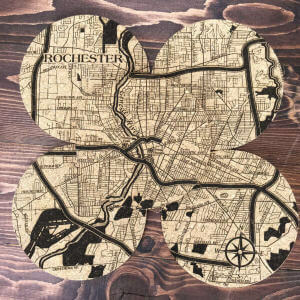 This isn't an ordinary coaster set - it's a Rochester NY mosaic coaster set. Again, this gift is great if your client is new to the area. Super affordable too! Commission a painting of your clients new home.Believe it or not, this gift is more affordable than you think,Instapainting.comis a great site to check out. This site is super affordable. They make it super easy, all you have to do is upload a photo and you should get your artwork in about 3 weeks. Moving is exhausting and who doesn't love feeling pampered once in a while? Treatyour clients to a spa day at a local spa. They can use your gift card for whatever it is they are longing for whether it be a massage, facial, etc..
Give your client a gift that will stand up to years of footsteps. 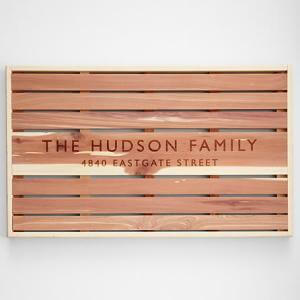 A personalized cedar wood doormat is unique and elegant. A historic local map framed nicely is a unique and thoughtful gift. Especially those who have relocated from another state. Framing can bedifficult - Irecommend using Framebridge.com. They make custom framing super easy. Address labels with your clients brand new address is a great closing gift idea.Check out Zazzle.com, they have so many designs to choose from. They also allow you to fully customize your labels which is nice. 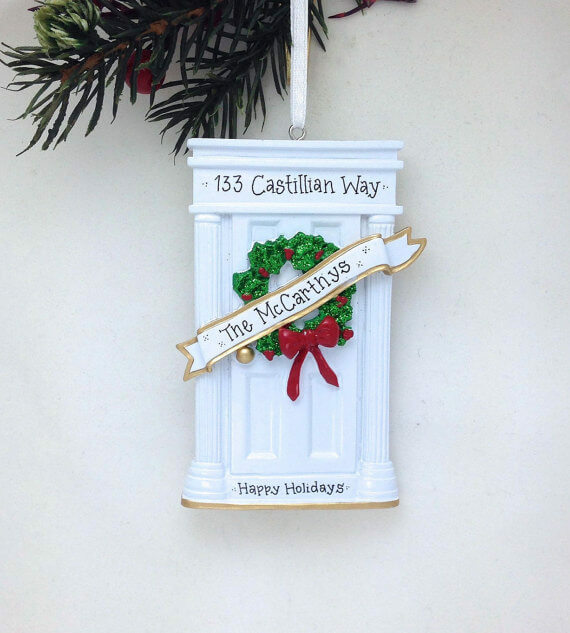 How adorable is this personalized ornament from AdornamentsNY shop on Etsy.com? This clever gift is perfect for clients who plan to close near the holidays. Gifting your client with a local activity is unique and memorable.It can be as simple as movie tickets to your local cinema. You can customize a self-inking stamp with your clients brand new home address. This gift idea thoughtful and super practical. There are hundreds of design options on Zazzle.com. You can keep it simple or create a stamp that is super unique. Headquartered in Rochester, New York, Premium Mortgage Corporation serves residential real estate markets across upstate New York, Florida, Vermont, Massachusetts, Connecticut, Pennsylvania and Ohio. Since opening in 1999, the company has grown to over 100 employees and attributes its success to matching mortgage financing to individual clients' needs, while also giving excellent customer service to real estate agents in the community. For ongoing mortgage news, please visit: www.premiummortgage.com and follow Premium on Facebook, Twitter, and Instagram.